We have talked in previous blogs about using adjustment shims in Weld Fixture Design. Here are some simple tips for using shims for adjustment in your machine tools. 1 – Use only shims that are be deburred – Often when thin metal like shim stock is cut, a small fold or melted metal layer can cause a burr. The burr will prevent you from easily removing or adding a shim when it is time to adjust your machine. 2 – Some companies use holes for the fasteners. They have their reasons. Maybe they think it is harder for the operator to remove a shim which would put the machine out of alignment. Some companies prefer slots. 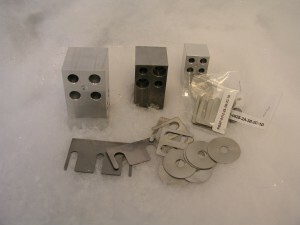 A shim pack consists of several thin metal shims of the same shape but can have the same or different thicknesses. It is faster to slide a shim out or insert a shim if you can use slots. Slots don’t apply in all instances. But where they can be used, instead of holes for the fasteners, it will save time when inserting or removing a shim. 3 – Use high quality, pre-cut shims. Cutting your own shims by hand out of a soda can or cheaper rolls of carbon steel or brass shim stock may save you money in materials, but will prove far more expensive than just ordering some shims from shim cutting professionals like Rentapen. Rentapen has in place a RAPid Order Processing System and a laser that keeps the costs of shims affordable. 4 – Don’t cut your steel shims with scissors! Burrs, blunders, finger cuts… And then you have to hammer or file down the burrs and bends that occurred while you were cutting. Now I am imagining finger slams… Ouch!! And, you can only cut so thick. Rentapen’s laser will cut up to .078” thick precision sheet steel or stainless steel. 5 – Get your shims from a place that puts each shim pack in a bag with a tag so that when it arrives at your factory you know what you have. 6 – To save design time, use Rentapen’s 3D download site to create the standard shims that you want. A part number for the shim pack will be created for you so you don’t even have to think about it. And you will have a 3D model of the pack to place in your designs. This previous blog shows how to use the 3D download website. 7 — Select your brand of pre-cut stainless steel shims and pre-cut steel shims with care. Check that your vendor uses precision shim stock which has a lower tolerance variation than regular sheet stock. Rentapen’s Team always de-burrs our laser cut shims. 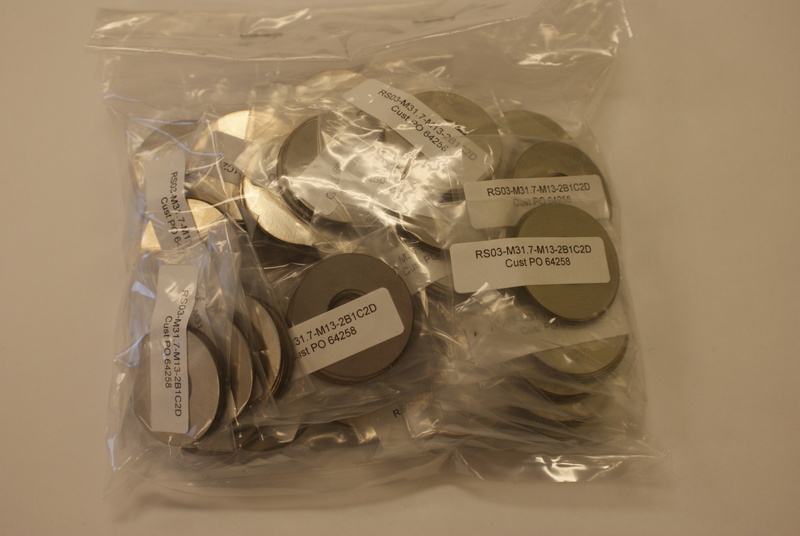 We use precision shim stock. And each pack is in a bag with a tag, just like the song says. Rentapen is the SHIM KING! Send your request for quotes and orders to sales at rentapen.com. Speaking of thin metal. I thought you would find this video interesting. It talks about welding thin metal to thicker metal. What an art welding is! Trick for welding thinner metal to thicker metal. If you want to learn from welders, check on this web site forum where you will find experienced and not so experienced welders chatting. FABTECH 2013 Chicago is coming! Fabtech 2013 starts November 18 in Chicago. Here is where you keep up to date on what is happening at the show.